We are proud to present our newly developed Plenum for the Porsche 997.1 Turbos! With this extreme high flow Plenum, the performance of your 997 generation 1 will increase! - do88 plenum is Y-shaped for improved air flow. Our plenum flows 34% better for GT3 throttle body and 18% better for OEM throttle body compared with the OEM plenum (see diagram below). The OEM 997 Turbo plenum is T-shaped which means the air flow from the throttle body abruptly change direction when it´s divided to each side of the intake manifolds. It makes sense to design a plenum with a Y-shape instead of a “bank into the wall” T-shape. During the development process of this plenum we spent a lot of time with flow simulations of the internal Y-shape design. We made both flow simulations on our CAD system and real tests on our own SuperFlow SF-1020 flow bench on 3D-printed models. The results of the final design were very impressive the do88 Plenum totally outperform the OEM Plenum by 34% increased flow at the same pressure drop! To be able to manufacture this final design we choose to make a 3D freeform designed casting. This construction adds a lot of performance but not so much of extra weight. We designed the outside of the plenum to add as little weight as possible to the plenum. do88 Performance Plenum weight 0,80 kg (1,76 lb) OEM plastic pipe weight 0,28 kg (0,62 lb) and competitor cast performance pipe weight 1,19kg (2,63 lb)! Our Performance plenum is a great upgrade both with the OEM 74mm throttle body or the more extreme 82mm GT3 version. 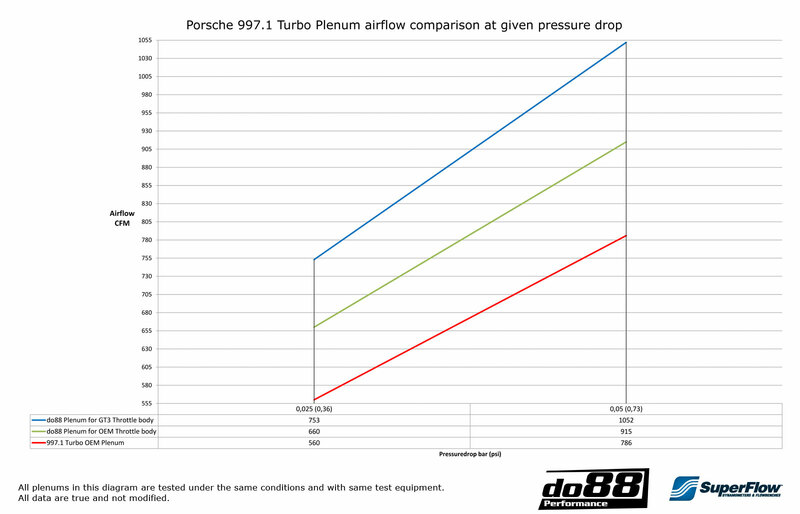 The do88 Performance Plenum is a bolt on with the 82mm OEM Porsche 997 GT3 throttle body. But you can also purchase our Plenum together with a CNC-machined adaptor plate which allows you to install it with the 74mm OEM Porsche 997.1 Turbo throttle body. Be aware of that the OEM parts was designed for the power level the car was built for originally. A power increase may cause your stock plenum to hold back the power of your engine. So even on an engine with a software tune the do88 performance plenum will give a performance increase! do88 performance plenum comes as a complete package with all parts necessary for installation. Select throttle body size. OEM 74mm or GT3 82mm. Please note, their is not any throttle body included in this kit!